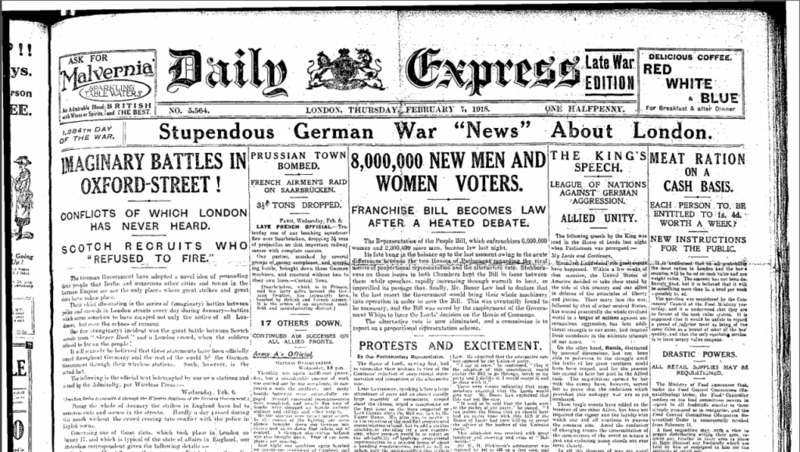 You can search individual titles, such as The Times, The Guardian and The Observer, The Scotsman, or cross-search a large range of titles, such as British Library Newspapers (that covers both local and national papers) or UK Press Online (which covers popular or tabloid press), to examine how the suffragette movement and cause was reported on, what the reaction to the Representation of the People Act 1918 at the time and further down the line. While the Representation of the People Act 1918 was front page news (as you can see above), the First World War was still ongoing at that time so around the time the Act was passed there’s perhaps not as much written about it as there might have been, even though as the Daily Mail (Hull, not London) notes “it might truly be said that this new Reform Bill creates an even greater revolution than the first Reform Bill of 1832”2. All online newspaper archives available via the Library can be accessed from the Newspapers & Magazines database list and magazines (or periodicals) can also be a rich resource for historical research. 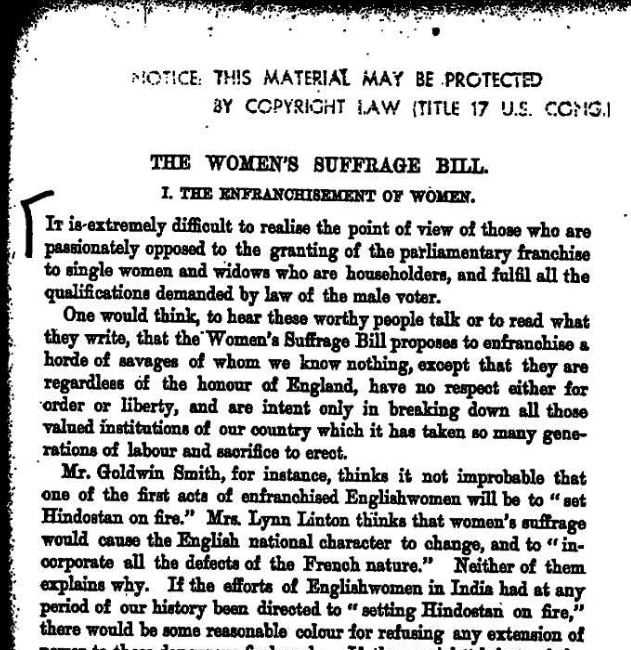 The quote in the title of this blog post comes from an article ‘What will they do with it?’ from a March 1918 issue of The Review of reviews and is attributed to Dame Millicent Garrett Fawcett (or Mrs. Henry Fawcett as she’s called in the article), president of the National Union of Women’s Suffrage Societies (NUWSS) for many years, when asked why women would want the vote. I found this interesting little article by searching British Periodicals Online which provides access to the full text of hundreds of periodicals from the late 17th century to the early 20th. You can access British Periodicals Online and other periodical and magazine databases via the Newspapers & Magazines database list. Want to look at more recent coverage of the suffragette movement? The Library also subscribes to databases, such as Factiva and Nexis UK, that allow you to search and access the full text of a large number of UK and international newspapers from around the 1980s up to date. You can access these, the databases mentioned above and many other newspaper archives and magazine archives from Newspaper & Magazines Databases. What do the archives tell us? Primary sources reflect the individual viewpoint of a participant or observer and they enable you to get as close as possible to what actually happened during an historical event or time period. Primary sources can include diaries, correspondence, historical and legal documents, eyewitness accounts, newspaper and magazine articles, statistical data, speeches, audio and video recordings, art objects, etc. While quiet lobbying still continued, the militant suffragette campaigns were discontinued during the First World War, however, this did not mean that women went quietly into the night. 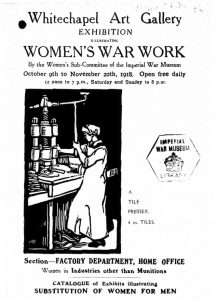 Screenshot of front page from Catalogue Of Women’s War Work Exhibition At Whitechapel Art Gallery 1918 [Archives Unbound]. The First World War had a revolutionary and permanent impact on the personal, social and professional lives of all women. Their essential contribution to the war in Europe is fully documented in Women, War and Society, 1914-1918 (from Archives Unbound) a definitive collection of primary source materials brought together in the Imperial War Museum, London. These are unique documents including charity and international relief reports, pamphlets, photographs, press cuttings, magazines, posters, correspondence, minutes, records, diaries, memoranda, statistics, circulars, regulations and invitations. The above database is just one of 265 primary source collections available to us you via Archives Unbound. It presents topically-focused digital collections of historical documents covering a broad range of topics from the Middle Ages forward-from Witchcraft to World War II to 20th century political history. You might also want to look at International Women’s Periodicals, 1786-1933: Social and Political Issues within Archives Unbound. This collection provides access to the full text of some of the most significant and least-widely held women’s periodicals produced from the late 18th century through the early 1930s. Some of these titles were conceived and published by men, for women; others, conceived and published by male editors with strong input from female assistant editors or managers; others were conceived and published by women, for women. The strongest suffrage and anti-suffrage writing was done by women for women’s periodicals. Thus a variety of viewpoints are here presented for study. As Archives Unbound covers such a vast range of subjects and collections, searching through the whole database will provide material perhaps from some surprising areas (so it’s very worthwhile doing this). The suffragette movement started in the 19th century born out of the huge economic, social, political and idealogical changes and issues of the time. British Politics and Society is packed with primary source documentation that enhances a greater understanding and analysis of the major restructuring of society that took place during the Industrial Revolution and of the development of urban centers. It presents materials that enable in-depth examination and analysis of the growing calls for political reform that were met with state resistance and marked a crisis of legitimacy for both the government and the reform movements themselves. Some other primary source databases you may want to have a look at include the Churchill Archive (includes more than 800,000 pages of original documents, produced between 1874 and 1965, ranging from Winston S. Churchill’s personal correspondence to his official exchanges with kings, presidents, politicians, and military leaders), House of Commons Parliamentary Papers (often referred to as U.K. Parliamentary Papers, covering early 18th century onwards. We also have access to the House of Lords Parliamentary Papers which covers the 19th century) and Empire Online (spanning the last five centuries this resource brings together manuscript, printed and visual primary source materials for the study of ‘Empire’ and its theories, practices and consequences. Includes interesting material on women’s suffrage in the colonies and from 1889 “The Women’s Suffrage Bill” by Dame Millicent Garrett Fawcett). Screenshot from Garrett Fawcett, Millicent. 1889. “The Women’s Suffrage Bill”, Vol. 51, pp555-567. [Empire Online]. All these primary source databases and more can be accessed via the Primary Source database list. The University of Edinburgh holds world class collections, including rare books, archives and manuscripts, art, historical musical instruments and museum objects. So I thought I’d have a quick surface level delve to see what we might hold on this theme. This really was just a quick delve so if you are interested in finding more material we might hold then take a look at the Centre for Research Collections (CRC) website which gives information on how to find material in their collections or go and speak to staff at the CRC enquiry desk on the 6th floor, Main Library (alternatively you can find their email and phone number on their website). We hold a range of publications originally held in the the library of the Scottish University Women’s Suffrage Union. Mostly published between 1900-1915 some examples include To women who are well off, Why men should help women in their claim for enfranchisement : the economic aspect and “Men are men and women are women”. You can find these and more in DiscoverEd and you need to speak to the Centre for Research Collections to gain access to the material. Also available via the Centre for Research Collections is an original 1911 edition of The suffragette: the history of the women’s militant suffrage movement: 1905-1910 by E. Sylvia Pankhurst (shelfmark: RB.S.1237). Not only is this copy signed by the author, Emmeline Pankhurst and Christabel Pankurst and has the original purple cloth binding, with the Suffragette portculis stamped on upper front cover but it also came with newspaper cutting memorabilia and correspondence addressed to Mrs. Morrow, signed and dated (23 Nov. 1913) by Christabel Pankhurst. Both the newspaper cuttings and letter can be found in EUL Manuscript Coll-146, you can also view a digitised image of the letter in our Image Collections (just search for Christabel Pankhurst). 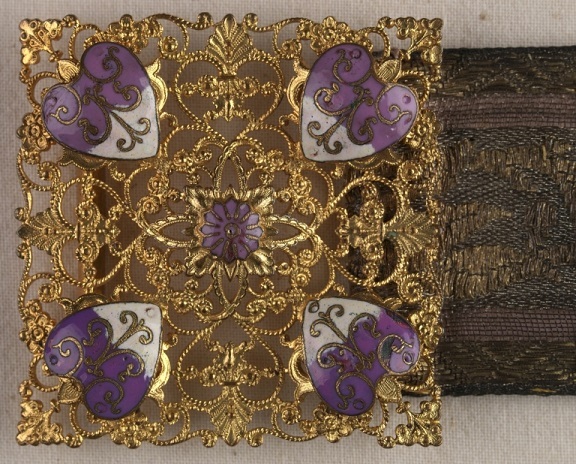 The University’s art collections also hold a fantastic Edwardian embroidered Suffragette belt (from around 1908-1909). You can view more high-quality images of the belt in our Image Collections. You can find lots of programmes, documentaries and films on Box of Broadcasts (BoB). Why not look out for Suffragette the 2015 film from Sarah Gavron recently shown on Channel 4 or the documentary Sophia: Suffragette Princess telling the largely unknown story of Princess Sophia Duleep Singh – descendant of Sikh royalty, goddaughter of Queen Victoria and pioneering suffragette. BFI InView allows you to find and view over 2,000 non-fiction film and television titles from the 20th century to the early 21st. Selected from the BFI National Archive the database allows you to explore and download rarely seen government films, written documents, newsreels, TV documentaries, discussion programmes, parliamentary recordings and much more in an indispensable resource for any study into the recent history of Britain. 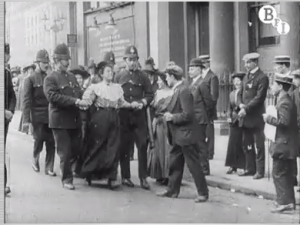 From 1913 you can view the short newsreel on the Trafalgar Square Riot which includes footage of Miss Sylvia Pankhurst being led away by policemen. Or from 1915 the newsreel of the Women’s March Through London Topical Budget 204-1 a significant public event as the suffragette’s were holding a officially sanctioned demonstration to show their support for the war effort. You may also want to look for the 1913 comedy Milling the Militants; A Comical Absurdity, a short film ridiculing those who have taken up the women’s sufferance movement. You can access BoB, BFI InView and other moving image databases from Image and moving image databases. “What will they do with it?” (1918). The Review of Reviews March 1918, 57(339): 210. British Periodicals. Accessed February 06, 2018. This entry was posted in Library, Online resource, Primary sources and tagged 19th century, 20th century, archives, Britain, correspondence, cultural history, Databases, First World War, gender studies, History, magazines, Manuscripts, newspapers, periodicals, Politics, primary source, social history, women's history by cstirling. Bookmark the permalink.